Our USC STAR team - doing science that truly matters! 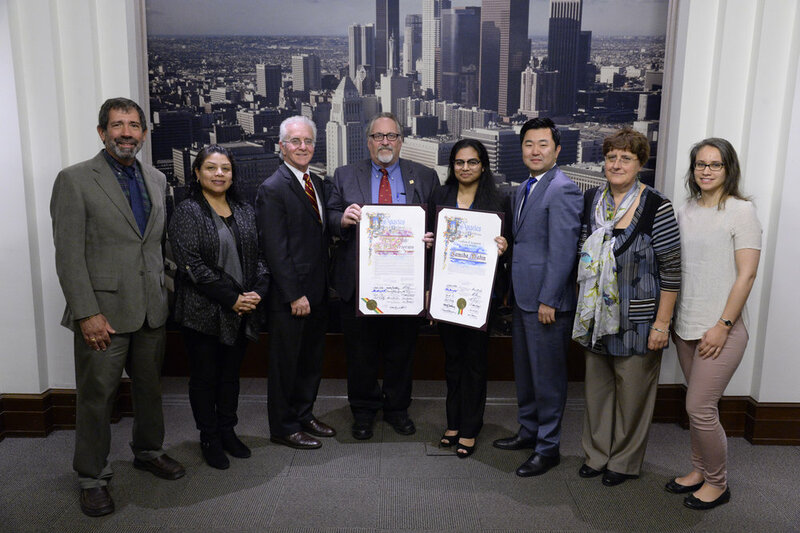 A USC program that brings together USC scientists and engineers with Francisco Bravo Medical Magnet High School students was honored at City Hall on March 21 by L.A. City Councilmember Paul Krekorian. Receiving special recognition was Bravo high school senior Samiha Mahin, a North Hollywood resident who spends her afternoons doing research in the lab of USC School of Pharmacy associate professor Martine Culty through the program. 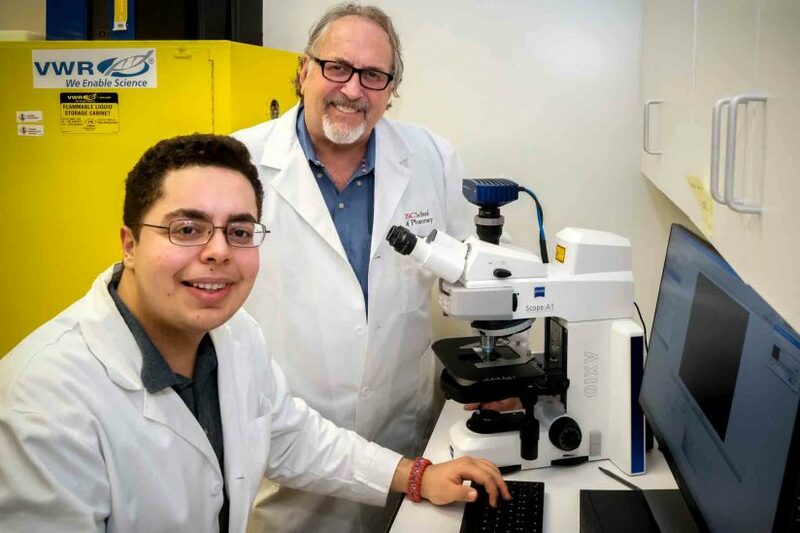 The USC STAR/EHA program, funded by USC’s Good Neighbors Campaign, offers an innovative approach to STEM education by providing high school students an entire year’s experience in USC research laboratories that is integrated with their academic curriculum. This level of engagement in a real research environment fosters the students’ interest in science and research, as well as prepares them for success in college. 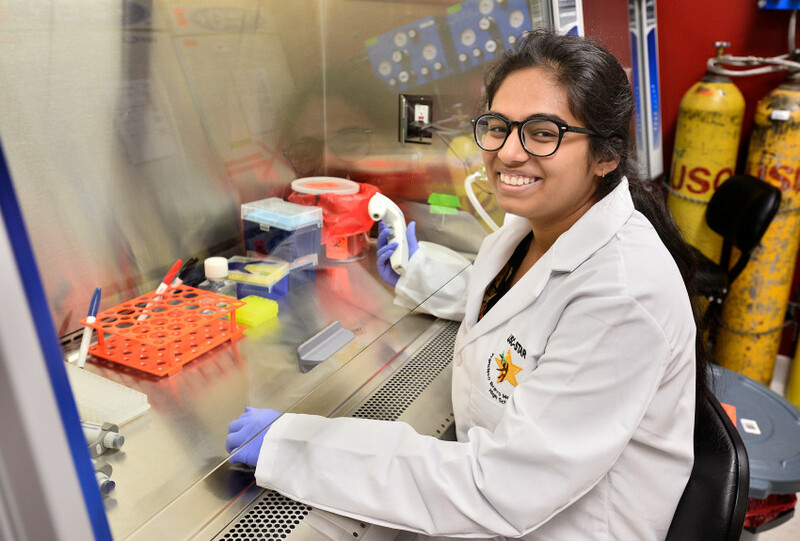 Mahin is one of 600 high school seniors who have participated in the program and studies the effects chemicals have on human reproduction organs at Dr. Culty’s Lab. For three years in high school, Mahin was also the lead researcher on the development of an artificial womb that provides optimal conditions for the development of premature babies. While the program was being honored, L.A. Councilmember David Ryu surprised the council by sharing that he too was an alumnus of Bravo high school and had participated in the STAR program during the late 1990s. Reminiscing on his experience, Ryu commended USC for its “tremendous effort” towards the program and thanked Councilmember Krekorian for honoring it. To watch a recording of the presentation at Los Angeles City Hall, click here. STAR/EHA Student, Sina Kiamehr, locks down early admit to Harvard University! Samiha Mahin, a 17-year-old high school senior from North Hollywood, has an insatiable thirst for knowledge. It’s what led her to a program at the USC School of Pharmacy. That’s where she commutes to after attending high school in L.A., where she’s built on her interest in the study of human reproduction. She studies chemical effects on male reproductive organs, and during her first three years in high school, she was part of a research team studying artificial wombs. But for Samiha, the daughter of Bangladeshi immigrants, the complications from premature births became not just the topic of a science fair research project. It became real-life. Shortly after completing the project for the science fair, her brother Nibbir was born prematurely. Like many premature babies, he was born with several genetic disorders. Suddenly, science fair research became real life for Samiha. For the full story, click here. On December 11, 2017, STAR/EHA students from Bravo Medical Magnet High School were invited to an end-of-year meeting at USC School of Pharmacy. Dr. Joe Cocozza and Dr. Daryl Davies advised students on how to use their experience in the STAR/EHA program to their advantage while applying to colleges. Students were also given an opportunity to talk about the research projects they have been a part of over the past year. Thanks to the following USC faculty members for participating in the 2017-18 STAR/EHA Program! LINCOLN HEIGHTS (CBSLA.com) — A leading Alzheimer’s disease researcher is helping inner-city kids use their bright, young minds. Dr. Roberta Brinton founded the USC Science, Technology and Research (STAR) program, which has led many students to careers in science and medicine. “The STAR program is the Science, Technology, and Research program that gives high school students at Francisco Bravo Medical Magnet High School the opportunity to learn science by conducting real science,” she said. Each year, about 20 high school students in their junior or senior year participate in the program, which was founded nearly 30 years ago. The students are able to walk to USC after school as their campus is just blocks away and work in an actual lab alongside scientists and engineers. “They are conducting research that is contributing to discovering a cure for Alzheimer’s disease, for cancer, for developmental disorders,” Brinton said. Congratulations, STAR Class of 2015! STAR Program alumni returned to Bravo High School to share their story of success with students.